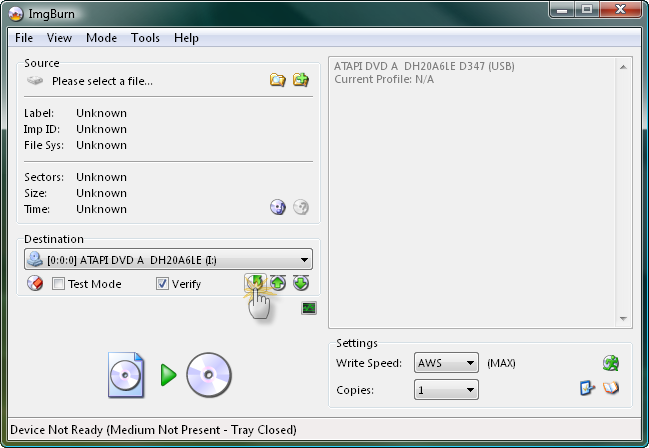 Hopefully it goes without saying that you need a PC connected Acronova Nimbie USB auto loader unit for what's written in this guide to actually work! 1. Connect your Nimbie USB unit to the PC and switch it on. 2. Download the attached 'BSRobots_x.x.x.x.zip' file and extract it to where you installed ImgBurn (i.e. C:\Program Files\ImgBurn). That should leave you with new files called 'BSRobots20.dll' and 'winusb.dll' in the same folder as ImgBurn.exe. 4. Click the 'Tools' menu and select 'Settings'. 5. Switch to the 'I/O' tab. 6. 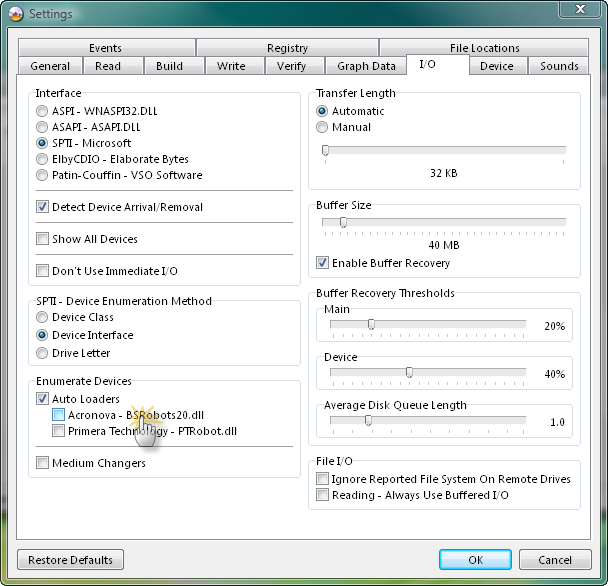 Locate the 'Enumerate Devices' box and enable the 'Auto Loaders' option. 7. 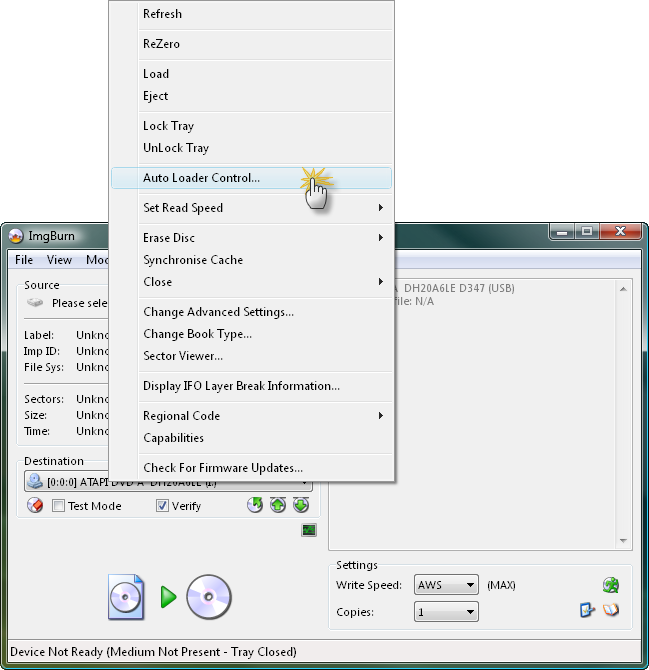 Now enable the 'Acronova - BSRobots20.dll' option. 8. 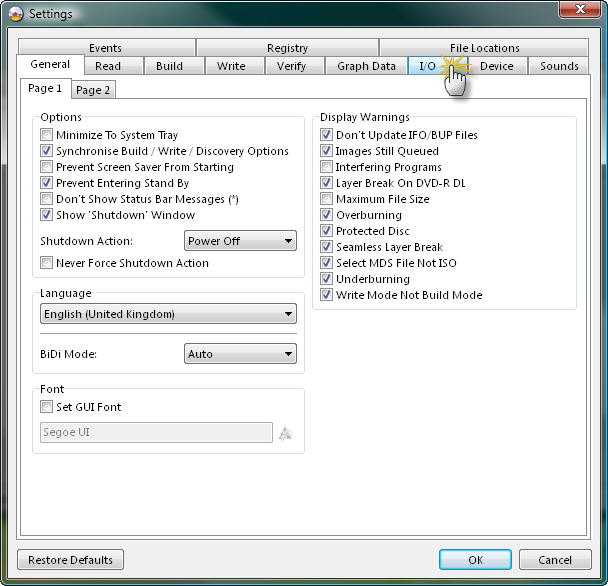 Click 'OK' to close the 'Settings' window. 9. 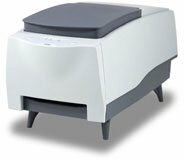 The program should now search for and detect your Nimbie USB unit. Of course you only need to do the above once! Next time you start ImgBurn, it'll automatically search for your Nimbie USB unit. 1. 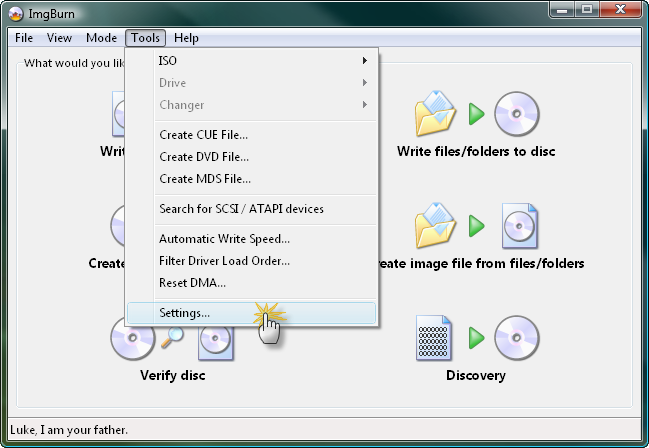 If you queue up multiple images or select multiple copies, ImgBurn will automatically eject/reject discs at the end of a burn operation and load the next blank disc so it can continue without user intervention. 2. 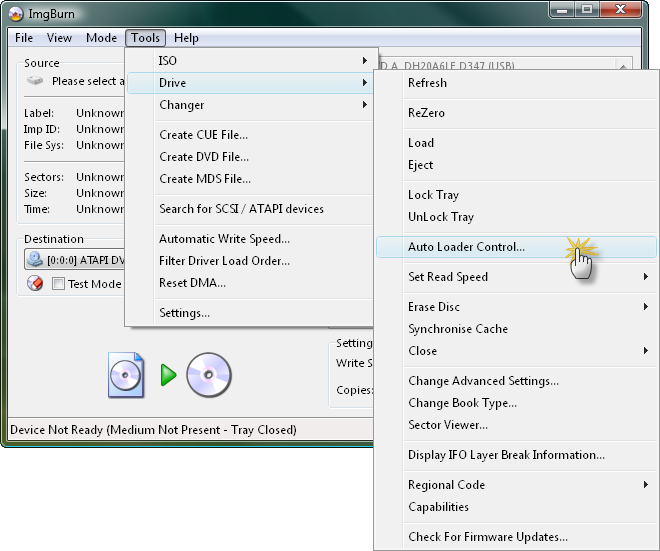 There's an 'Auto Loader Control' screen that allows you to perform basic operations such as load and eject. 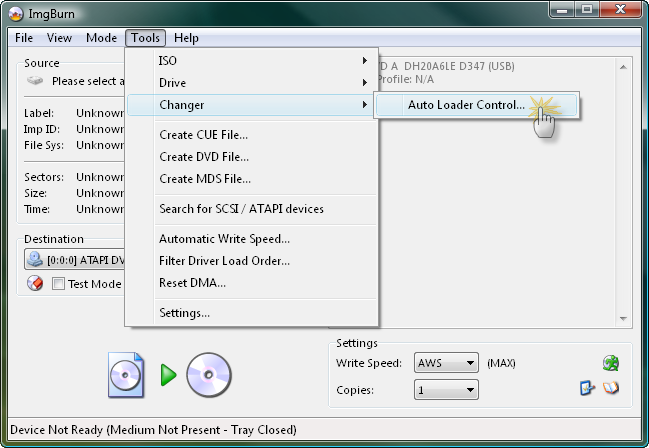 i. Click the 'Tools' menu, then click 'Changer' and finally 'Auto Loader Control'. ii. 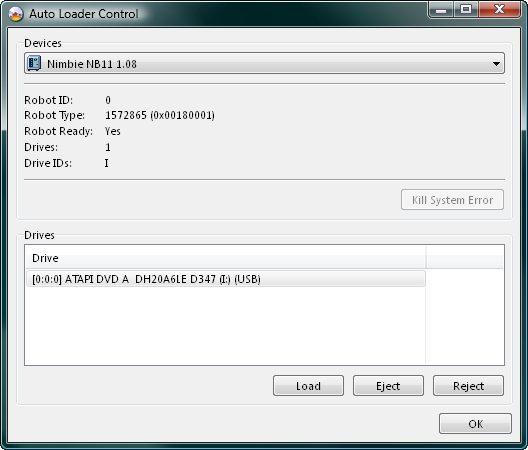 When the active drive is the one inside the Nimbie USB unit, click the 'Tools' menu, then click 'Drive' and finally 'Auto Loader Control'. iii. When the active drive is the one inside the Nimbie USB unit, you'll get a new 'View Changer Control' button next to the usual Load/Eject ones. Click that! iv. 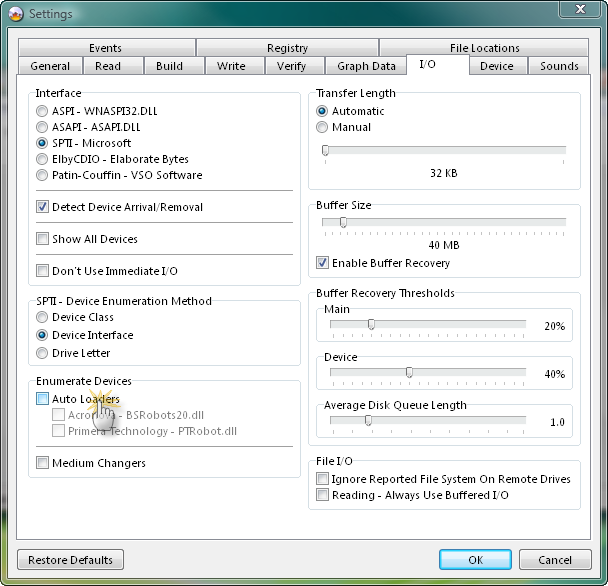 When the active drive is the one inside the Nimbie USB unit, right click the drive selection box and select 'Auto Loader Control' off the context menu.